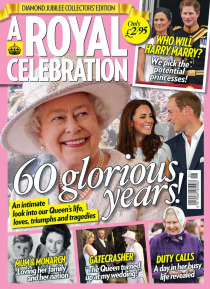 Hearst Magazines UK Weeklies group, the people behind weekly favourites Best, Inside Soap and Reveal are delighted to offer you A Royal Celebration; an intimate insight into our Queen’s life, loves, triumphs and tragedies. Celebrating 60 glorious years, A Royal Celebration is a glossy and exciting souvenir to be enjoyed time and time again. In this fun collectors’ edition we look back at the Q… ueen’s six decade reign, and lift the lid on her life today. We also showcase the new generation of Royals, and reveal what the coming years may hold for the family. With a guide to the Jubilee celebrations, as well as ideas for sensational street party food, this is the perfect companion to what is set to be a true moment in history.